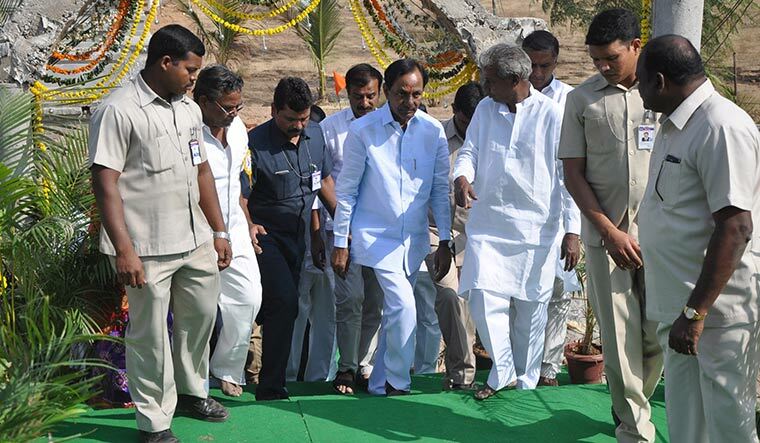 Tough road ahead: Chandrashekar Rao in Gajwel. A strange calm envelops Gajwel, a town about 60km from Hyderabad. The streets show no sign of an upcoming election, party offices seem to be sleeping and there are no leaders smiling at you from hoardings. Ask anyone on the street though, and they will tell you it is the calm before a storm. In a few weeks, Gajwel will see the toughest electoral battle in Telangana, featuring Chief Minister K. Chandrashekar Rao. The sitting MLA is not just the face of his party, the Telangana Rashtra Samithi (TRS), but also of the state, India’s youngest. A mass leader and an excellent orator, Rao’s shrewd yet risky moves have taken him far. He has not lost an election in the past 30 years. This time, however, he is in a precarious situation. On December 7, Gajwel will vote, and the state will watch closely. A loss for Rao would reshape not only Telangana politics, but also within the TRS. His family has a handful of lawmakers; Rao’s fall would change power equations within the party. Gajwel has seen a lot of development in the past four and a half years, and is touted as a model constituency. Well-laid roads and pleasing LED streetlights welcome you to the town, with a lot more in store. There are rows of charming structures on a sprawling campus, part of an education hub that was Rao’s brainchild. A clock tower lends a colonial feel to a yet-to-open integrated market, which will sell vegetables, fruits and meat. There are also integrated office spaces, a ring road, a 100-bed hospital, an auditorium, and parks and beautified lakes. If that is so, why should Rao worry? Well, for starters, he seems to have earned the tag of an invisible leader, and is also seen as an outsider. Rao hails from neighbouring Siddipet town, from where he has won six assembly elections. In 2004, he also won from Karimnagar Lok Sabha constituency, and left Siddipet to his nephew Harish Rao. His association with Gajwel started in 2008, when he bought land in Erravalli village, which is in the constituency. He then built a farmhouse there and has been a regular visitor since. In 2014, banking on the pro-Telangana sentiment, he contested from Gajwel to the assembly and won by a little more than 19,000 votes. The constituency has 2.27 lakh voters. This time, however, the fight will be tougher. 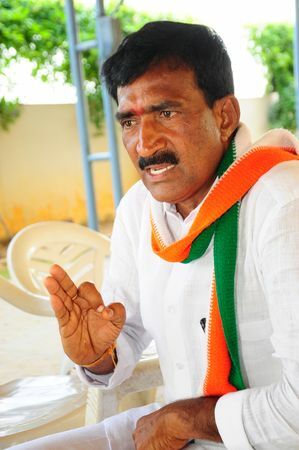 His chief opponent, Congress leader Vanteru Pratap Reddy, enjoys a rapport with voters that Rao does not. For the past 15 years, Reddy has been meeting bereaved voters and donating about 015,000 to the families. This has earned him immense goodwill. Reddy’s confidence comes, in part, from the numbers. In 2014, Reddy, as a candidate of the Telugu Desam Party, came a close second to Rao. This time, however, he is with the Congress, and an alliance with the TDP is on the cards. With both parties working together, Reddy is sure that he will trounce Rao. Moreover, there seems to be a consolidation of the Reddys in Gajwel. The politically influential community seems to be rallying behind Reddy; his rival Rao belongs to another powerful upper caste, the Velamas. Apart from caste, there also seems to be widespread sympathy for Reddy. Apparently, he had to sell all his property because he lost two elections, and now lives in a rented house. In view of this, several voters said he should be given another chance. Also, farmers in the area did not seem impressed by loan waivers and welfare schemes. And though the votes from the affected villages may only be a few thousands, in a close battle, every vote counts. Political observers say Rao is in a tricky position. If he chooses to fight from a second seat or selects another constituency, it will be a moral victory for the opposition. And, if he loses, it would be the biggest upset of the assembly elections.